For improving athletic performance and injury prevention, Core Stability / Core muscle conditioning is paramount. However, there’s often confusion to what represents the “Core”. The average person refers to the Core as being around the abdominal region, hence the unlimited Instagram and Social Media exercise routines. Whilst the abdominal region is part of the “Core” its existence and function is far greater than what most Social Media Accounts would have you believe. To prevent injury and improve athletic performance as stated earlier, Core Stability / Core muscle conditioning is Paramount. The core requires a 3 dimensional prospective. 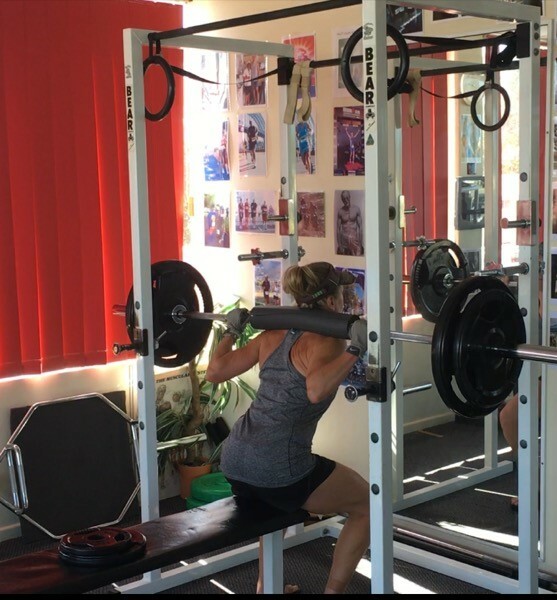 The Spine needs to be Stable enough to absorb loads that try to shear, compress, twist, stretch apart whilst simultaneously moving in all 3 planes and act as the foundation for precise limb movements ( strength, power, speed, endurance ). Core Stability / Core muscle conditioning is absolutely essential to run fast, long, descend safely, change direction quickly, and survive that loose rock you decided to side step on whilst flying down a steep rocky trail. 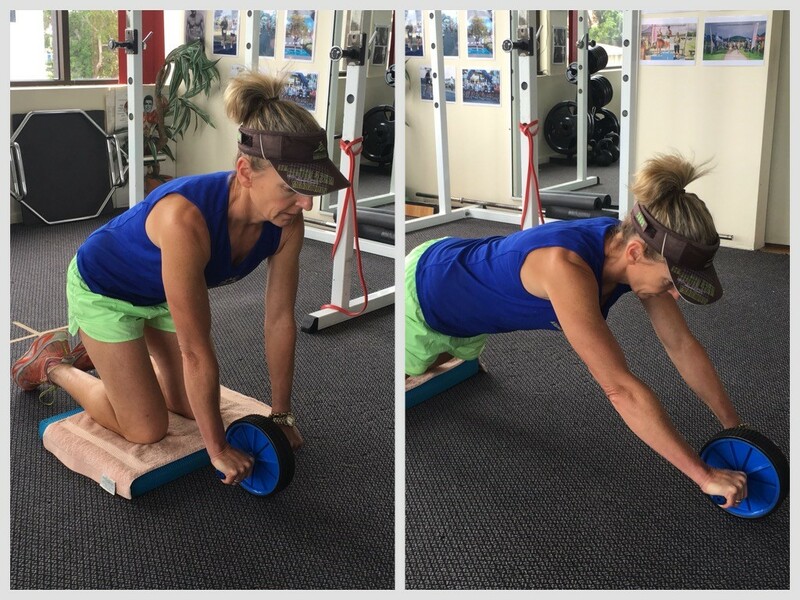 Core Stability for Runners is all about having a “stable Trunk and Pelvis” so the legs can drive off a stable base, produce force and not waste any energy. There is a common saying amongst the movement gurus. “you can’t fire a cannon from a canoe” unless of course you can stabilize and strengthen that canoe. I also believe that many people don’t know how to activate their own core muscle therefore making strengthening them a difficult prospect. For those people I recommend finding a Qualified, experienced, Sports Physiotherapist or a Qualified Strength and Conditioning Coach to assist in the initial activation stage. 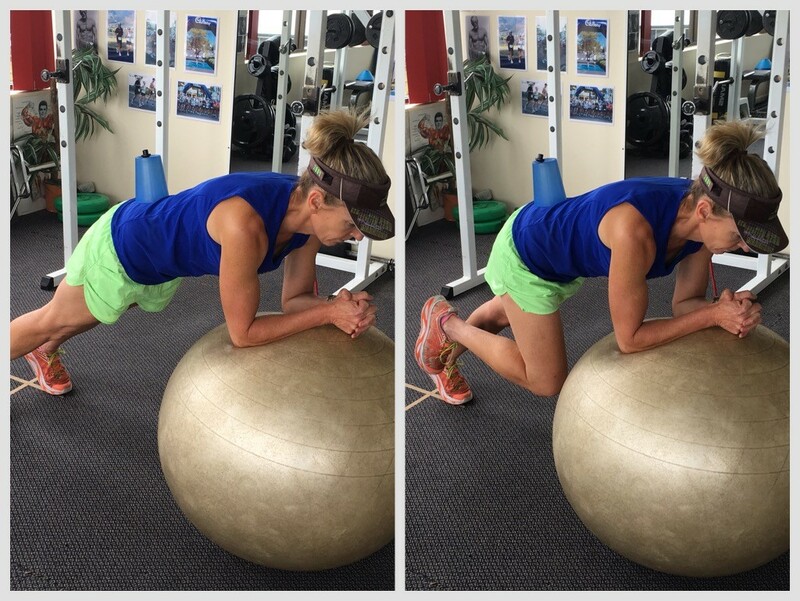 Attempting many of the advanced core exercise before comprehension of the core muscles and the ability to activate them sufficiently can potentially expose you to a greater risk of injury. Presuming you already have good “core ” awareness and activation here are some of my favorite exercises. You will immediately notice that my favorites are not floor exercise or circus routines often seen on social media. Running is an upright activity and such once the activation stage has been mastered then core stability and core muscle conditioning is best developed in an upright position. Basic functional primal movement pattern, some EMG studies have shown depending on the weight lifted a greater core muscle activation than any floor abdominal routine. Although the movement may be in 1 plane (Sagittal) the body has to stabilize in all 3 planes. The core has to resist not only falling forward or backwards, but side to side and resist any twisting movements as well. Some people may enquire why the squat as we run on one leg at a time? Yes that is true, but you can handle a lot more weight with a bilateral movement therefore stimulating more muscle, increasing your core strength to a greater degree. Bilateral movements should always proceed unilateral movements in a progressive format. You must crawl before you can walk! Lack of Hip Stability is a common cause of running injuries. Hip instability is increased on uneven, rocky, slippery muddy trails or water crossings. 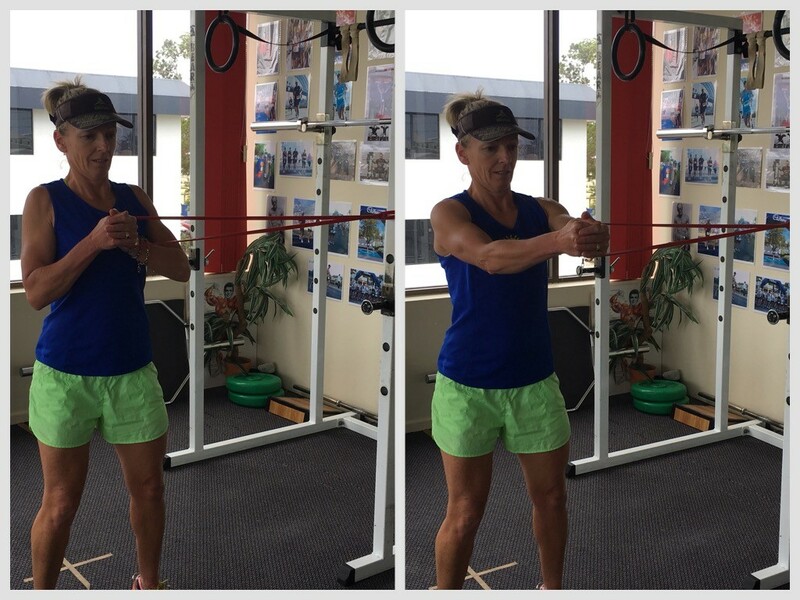 The purpose of this exercise is to unevenly balance the body to teach the nervous system how to adapt quickly to any change in the line of pull. 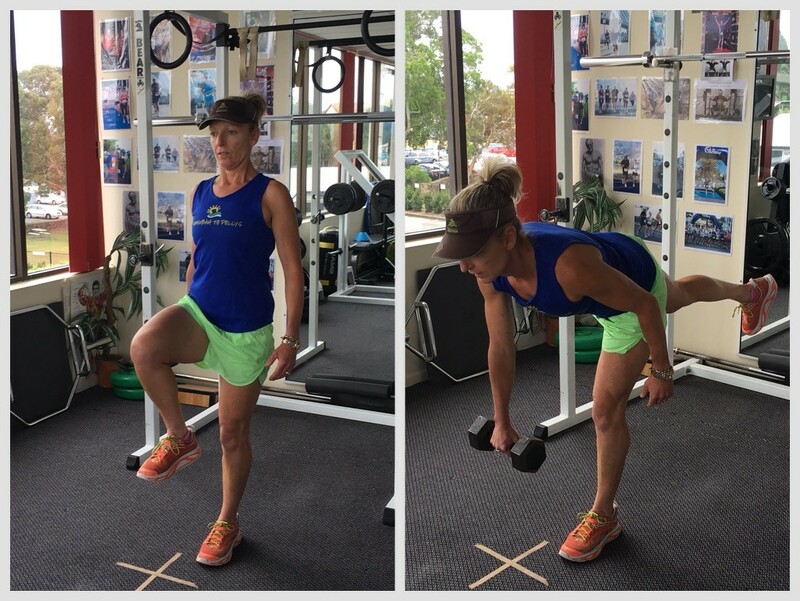 For this exercise to be effective the dumbbell needs to be heavy enough to throw you off balance. I find it is best to perform the Single D/ B Walking Lunge heading into a mirror so that you can check your front Knee is not moving inwards ( valgus ) as you perform the movement. Maintain an upright posture and the purpose of the exercise is to try and keep your hips level to the ground at all times. 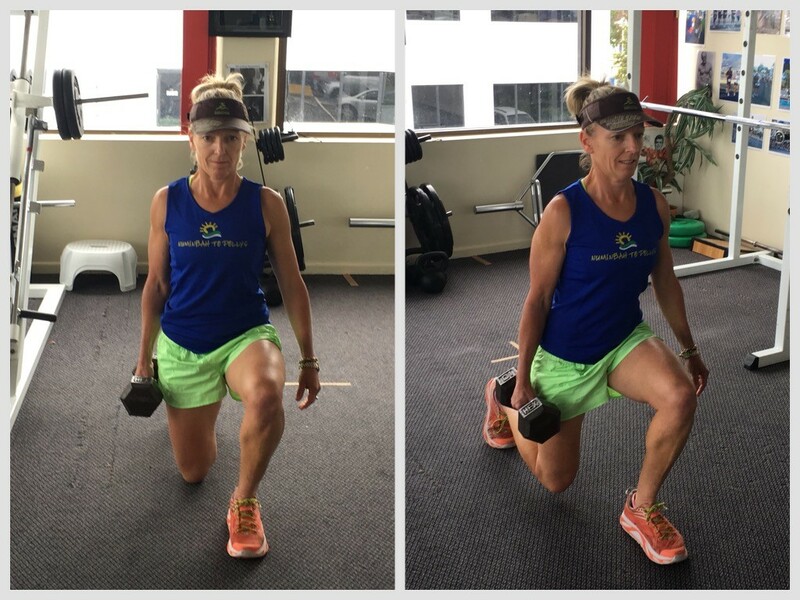 It is also an excellent unilateral exercise for strengthening the posterior chain, the quadriceps and picking up any muscle imbalances on either side. Perform 10 walking reps per side, then swap the D/B into the other hand and return. The purpose of this exercise is to not only develop the posterior chain, but also to develop the hip hinge co-activation and co-ordination of the gluteal and hamstring muscle groups whilst maintaining a level pelvis, hips and a neutral spine. You will notice a lot of instability initially, but your nervous system will soon switch on and each attempt will show improvement. 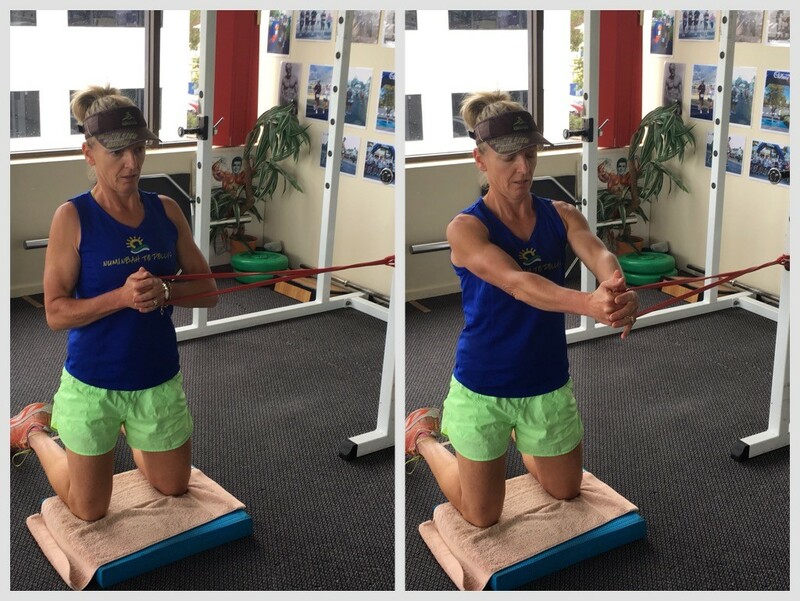 I also like a high knee finish to the movement to activate the hip flexors which are another core muscle group used in running. 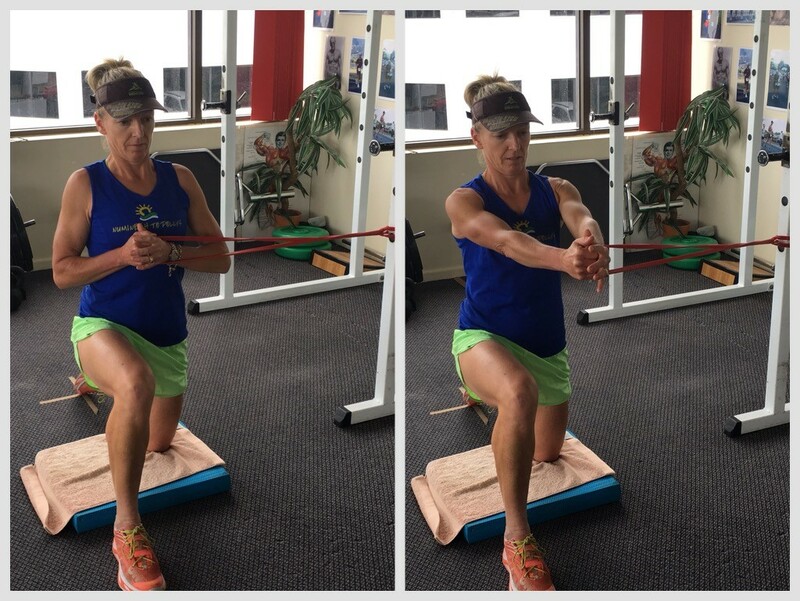 This exercise is an excellent anti-rotation movement. It teaches your muscles to switch on quickly, correct and resist any unwanted twisting or lateral movements. I like all 3 variations, Standing, Kneeling and in the Lunge position. The variety is what you are after, always challenging the nervous system. Choose a band which is strong enough that you must fight to stay in line with and do the exercise explosively when straightening the arms and then slowly return to the start position. This is more of an advance activation exercise, learning how to Brace and control any unwanted movement around the pelvis and hips, whilst simultaneously moving your arms and or legs. I like to do 5 circles to the left then 5 circles to the right, followed immediately by doing 10 knee touches to ball ( Mountain climbers ) per side. To check your pelvis and hips are not moving I place an upside down cup on the participant’s lumbar region with another moveable object on top eg. Marble or similar. The goal is to not lose the marble or the cup during the entire set. This ensures your pelvis and hips are staying still. Once again this is another advance activation exercise with the emphasis on strength, you have to get stronger to maintain Pelvic Stability the lower you go. Once you feel your Lumbar spine is moving, concaving, return to the start position using your core muscle under stretch rather than focusing on your arms to do the work. The purpose of this exercise is to not move your spine out of neutral. There is no point going all the way to the ground just because your arms may be strong if you cannot hold a neutral spine through the entire range.